It is situated in a landscaped garden near the Mekong River and the Nam Khan River confluence. It has dazzling mosaics and interesting Buddha images housed in a sweeping three-tiered roof and traditional Luang Prabang-style edifice. Its interior and exterior walls are swathed with shiny black coating with some characters, figures and symbols written all over a gold leaf. Its entrance is gold-plated and there are white pillars with lotus buds on the sides. In the past, this temple was where Kings of Laos were crowned in coronation ceremonies. It was a royal temple used mainly by the Royal Family. However, when the Communist Party succeeded in overthrowing the monarch government in 1975, religious ceremonies and rituals were no longer held at the Wat Xieng Thong. The topography of the temple is also the source of many legends that have been told for generations. At the site where the Nam Khan River flows into the Mekong River is where the two hermits who founded Luang Prabang were said to have placed a settlement marker for the city. Another legend has it that a merchant built a palace in the area and made himself the first king of the new capital and the founder of the Wat Xieng Thong. The confluence is also said to be the home of two spiritual water snakes that guard the river. 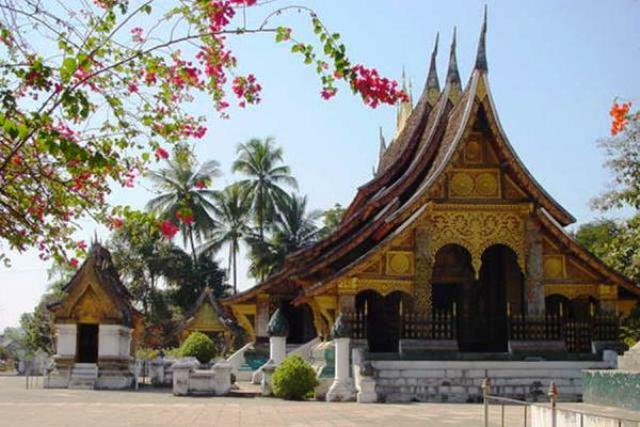 Because of its colorful background and the fascinating structures found within, most consider the temple to be the must-see of all the 30 wats or temples in Luang Prabang. There are two entrances to the temple: the North-West entrance at Thanon Manthatourath (Souvanhakhampong Road) which faces the Mekong River and the entrance facing the main road of Luang Prabang, the Thanon Phothisalat (Sakarine Road). The first is the main entrance of the temple. Inside, the walls and the pillars are coated with black lacquer and ornamented with characters and figures done in yellow stencil. Up the ceiling, there are red beams with yellow stencils of figures as well. The back side of the shrine is decorated with a mosaic of a golden tree in mirrored and stained tiles. This tree was said to be the origin of the temple’s name. Next to the shrine is a small “Wiharn” with a reclining Buddha statue. A Wiharn is a place inside a temple where lay people are allowed. It is where merit-making ceremonies and sermon preaching are usually done. The image of the reclining Buddha actually dates back to the construction of the temple and is very old. This Buddha image is one of the most revered statues in the temple by the Luang Prabang locals. If temple-visiting is on the top of your list of “must-do” in your Luang Prabang vacation, the Wat Xieng Thong should definitely be the first temple on the list. With rich history and religious significance, it truly is a must-visit in the city.